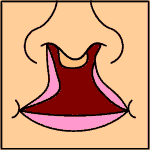 A cleft is a separation in a body structure. Clefts that occur in the oral-facial region often involve the lip, the roof of the mouth (hard palate) or the soft tissue in the back of the mouth (soft palate). Two major types of oral-facial clefts are cleft lip/palate and isolated cleft palate. If only skin tissue is affected one speaks of cleft lip. Cleft lip is formed in the upper lip as either a small gap or dent in the lip (partial or incomplete cleft) or continues into the nose (complete cleft). 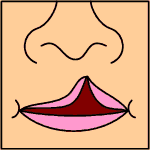 Lip cleft can occur as one sided (unilateral) or two sided (bilateral). It is colloquially called hare-lip (because a hare's lip is similarly cleft), or even hair lip (misspelling of the previous). Cleft palate is a condition in which the two plates of the skull that form the hard palate (roof of the mouth) are not completely joined. The soft palate is in these cases cleft as well. In most cases, cleft lip is also present. Palate cleft can occur as complete (soft and hard palate, possibly including a gap in the jaw) or incomplete (a 'hole' in the roof of the mouth, usually as a cleft soft palate). 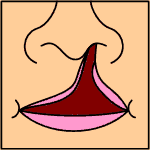 When cleft palate occurs, the uvula is usually split. During the first six to eight weeks of pregnancy, the shape of the embryo's head is formed. Five tissues grow: one from the back of the neck over the top of the head down towards the upper lip, two from the cheeks and meet the first layer to form the upper lip and two from each side form the chin and lower lip. If these tissues fail to meet, a gap appears where the tissues should have joined. The cause of cleft lip and cleft palate formation is genetic in nature. A specific gene that increases three-fold the occurrence of these deformities has been identified in 2004 as reported by the BBC . If a person is born with a cleft, the chances of that person having a child with a cleft, given no other obvious factor, rises to 7 in 100 (instead of 1 in 700). Folic acid reduces the odds slightly. Clefting seems to be at least in part related to ethnicity, occurring most often among Asians, Latinos and Native Americans (1 in 500), next most often among persons of European ethnicity (1 in 700) and least often among persons of African ethnicity (1 in 1,000). In some cases, cleft palate is caused by syndromes which also cause other problems. Many clefts run in families, even though there does not seem to be any identifiable syndrome present. Within the first 6 months after birth, surgery is performed to close the gap in the lip. Most large hospitals have a Cleft or Craniofacial team of specialists to treat children and aid parents. Often an incomplete cleft requires the same surgery as complete cleft. This is done for two reasons. Firstly the group of muscles required to purse your lips run through the upper lip. In order to restore the complete group a full incision must be made. Secondly, to create a less obvious scar the surgeon tries to line up the scar with the natural lines in the upper lip (such as the edges of the philtrum) and tuck away stiches as far up the nose as possible. Incomplete cleft gives the surgeon more tissue to work with, creating a more supple and natural looking upper lip. Cleft palate also can be corrected by surgery, usually performed between 9 and 18 months. Combinations of surgery methods and repeated surgeries are often necessary as the child grows. Physical defect in the development of the upper part of the mouth, including the lip and palate, or roof of the mouth.